This morning GLAAD released their annual Where We Are on TV report, which looks at the overall diversity of primetime scripted series regulars on broadcast networks and assesses the number of LGBTQ characters on cable networks and original scripted streaming series on the services Amazon, Hulu, and Netflix for the 2018-2019 TV season. This year, there is a ton of good news coming out of the report, indicating that TV is looking more queer and diverse that ever before. Still, there is more work to be done. As you’ll see below, asexual and LGBTQ folks with disabilities are still vastly underrperesnted on televsion. - A record-high percentage of LGBTQ series regulars on broadcast television at 8.8% of all series regulars, up from 6.4% last year. - LGBTQ characters on broadcast television are at gender parity with equal percentages of men and women (49.6%). - For the first time, there are more LGBTQ people of color (50%) than white LGBTQ people (49%) on broadcast television. - The number of regular LGBTQ characters counted on scripted primetime cable increased to 120, while recurring characters increased to 88, making for 208 characters. - There were 75 LGBTQ regular characters counted in original scripted series on the streaming services Amazon, Hulu, and Netflix as well as 37 recurring characters, for a total of 112 LGBTQ characters. - Bisexual+ characters make up 27 percent of the LGBTQ characters tracked across all platforms (broadcast, cable, streaming originals), a slight decrease in percentage from last year, but up to 117 characters from 93 in the previous report. The numbers still skew toward women, though there was an increase in bi+ men this year (84 women to 33 men). - This year, there are 26 regular and recurring transgender characters tracked across all three platforms, up from 17 last year. Of those, 17 are trans women, five are trans men, and four are non-binary characters. - Last year was GLAAD's first inclusion of asexual characters in our annual count. 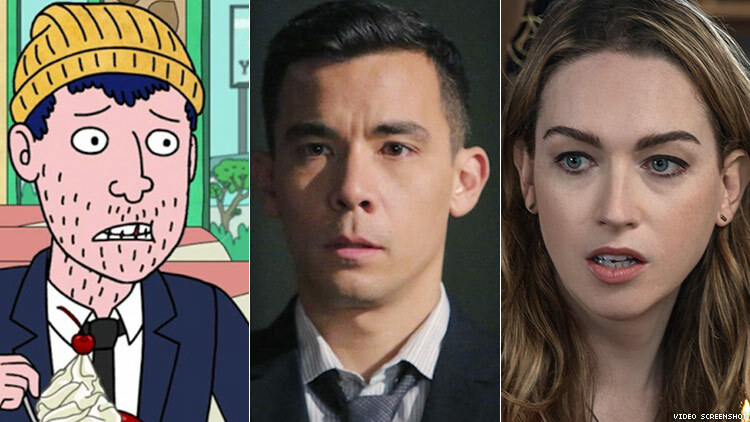 Both characters (Raphael Santiago on Freeform's Shadowhunters, Todd Chavez on Netflix's BoJack Horseman) have returned from the previous year, but no additional asexual characters have been added. There still no ace characters on broadcast. - Only 43 percent of the regular characters counted on broadcast primetime television are women, the same percentage as last year and a severe underrepresentation of the U.S. population, which is estimated to be 51 percent women. - The amount of regular primetime broadcast characters counted who have a disability has slightly increased to 2.1 percent, but that number still vastly underrepresents the actualities of Americans with disabilities. There are seven characters across all three platforms tracked (broadcast, cable, streaming) who are HIV-positive, a substantial increase from last year's two. - Netflix counts the highest number of LGBTQ characters on all streaming services and FX counts the highest number on cable networks. The CW boasts the highest percentage of LGBTQ series regular characters of the five broadcast networks. You can read the entire report on GLAAD here.